Richard has been working in the film and TV industry since 2009, having beaten 731 other applicants for an apprenticeship at Millennium FX where he honed his skills. In the last seven years he has contributed to many screen creatures, characters and effects working as a freelance technician and on set makeup artist including work for ‘A Fantastic Fear of Everything’, ‘Doctor Who’, ‘Casualty’, ‘Mission 2110’, Lady Gaga’s ‘Born This Way’ video, ‘Being Human’ and ‘Wizards Vs Aliens’. More recent movie credits include ‘Hercules’, ‘Spectre’, ‘Victor Frankenstein’, ‘The Forest’ and ‘Assassin’s Creed’. Richard was also recently part of Millennium FX’s prosthetics crew on ‘A Midsummer Night’s Dream’ for the BBC, which was aired this spring as part of their Shakespeare Festival. As well as his screen work Richard is a specialist in hyperrealism. His fastidious attention to detail makes for superbly lifelike work and his company RMFX creates hyper-realistic statues and busts for museums, events, collectables companies and the medical industry, for which he uses many of his own innovative techniques. 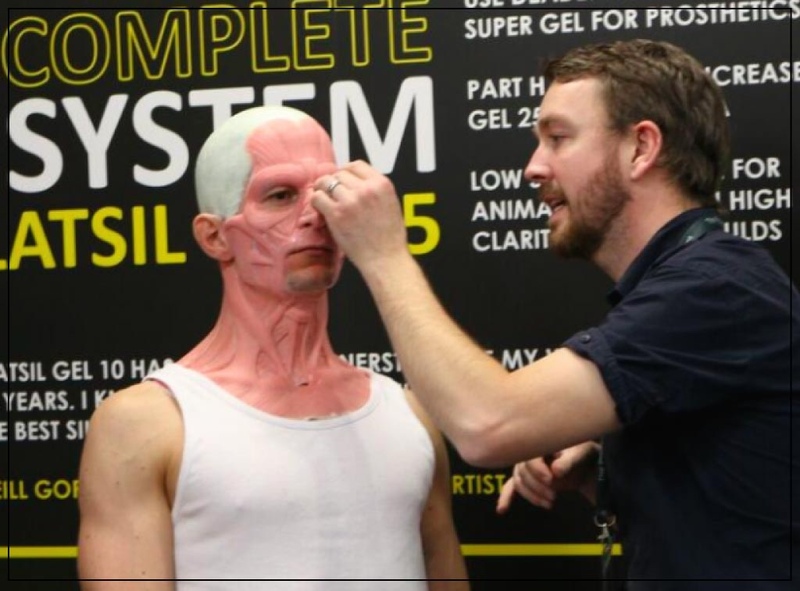 He also teaches for Gorton Studio and is often a contributor to Prosthetics Magazine – look out for an article about another specialist avenue of Richard’s work in an up-coming issue!